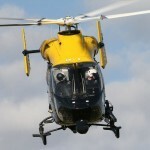 The National Police Air Service (NPAS) has – as HeliHub.com predicted in February 2015 – started to retire the MD Explorer from law enforcement work in the UK skies in preference for the Airbus H135, H145 and some yet-to-be-delivered Vulcanair P68 fixed wing aircraft. Two Explorer airframes are already parked up pending disposal, with G-SYPS in storage at Gloucestershire with Specialist Aviation Services (SAS), and G-SUSX at Redhill. The Redhill base has recently converted to the EC135. Meanwhile, Bond Air Services have handed over the first of seven upgraded EC135s to NPAS as the oldest examples are upgraded to the same operational standards as the newer ones. As NPAS works through its planned base closures, so further MD Explorers will be taken out of active service, with G-CMBS ear-marked to be next at Sheffield on 31st January 2016. None of the other base closures – North Midlands in January 2016 along with Warton, Durham Tees Valley and Wattisham between then and April 2017 – currently operate Explorers, but they will free up EC135s to replace Explorers at Barton, Wakefield and Bournemouth. That covers the current NPAS fleet of six Explorers. A seventh example will come under NPAS control when Humberside Police eventually sign on the dotted line – although their aircraft is expected to be put straight into storage at that point. The outlook for the MD Explorer in the UK looks bleak. Of the current fleet of 24 – approximately one quarter of the global active fleet – we know the seven law enforcement ones heading for disposal (as detailed above), and a further six in the air ambulance role expected to be replaced by the six AW169s on order with SAS. Additionally, SAS already has three uncontracted Explorers, partly used for maintenance cover of the others in their fleet, to which a fourth will be added on 30th November when their lighthouse support contract expires. Finally, for now, Yorkshire Air Ambulance have an Airbus H145 on order to replace Explorer G-SASH – and (uncharacteristically) the Airbus Helicopters press release even stated that Explorer’s registration when announcing their sale.